Should I suffer through another fried creation at the Kentucky State Fair? The Kentucky State Fair is here again, and I will make it out to there before the festivities end Aug. 28. I’m excited to see all the exhibits and contest entries, and I even entered a couple of baked items in the culinary competition. And of course, I’m looking forward to the fair food. Two doughnuts, one burger, lots of regret. 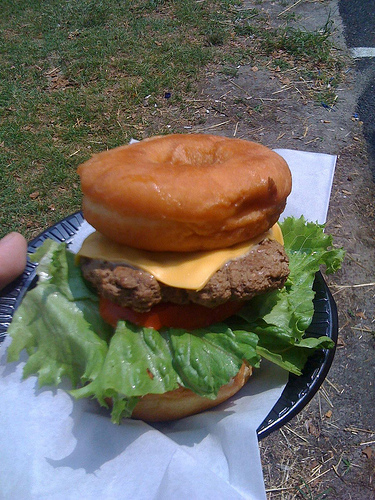 I challenged myself to eat the Krispy Kreme burger at the 2010 Kentucky State Fair. Though my stomach wasn’t so happy, it was kind of fun to eat something that outrageous and brag about it later. I don’t, however, advocate eating this more than once a year. I will leave it up to the readers to decide what I should try at this year’s fair. Should I go crazy and get something similar to the Krispy Kreme burger? Or should I keep it simple with basic fried foods? I really have to see that Fried Kool-Aid. That is some crazy stuff. I have heard of fried butter. They take a half a stick of butter, dip it in egg, then in some cinnamon sugar flour mixture, then fry it. Most of the butter melts inside so you have a buttery pastry. Sounds like a heart attack though! You know my feelings on this country’s obsession with frying things. At Laun World we watched the people on the news talk about Fried Kool-Aid. Fried Kool-Aid is the State Fair’s new Krispy Kreme Donut Burger. And frankly, I’m against it. I support you no matter what (well until the year when Fried Beer is perfected … I will NEVER support someone drinking [eating] one of my most beloved beverages once it’s been fried), but I’d stay away from all these Fried Fads.